The Landwind X7 has been facelifted for the first time since its reveal caused outrage for its similarity to the Range Rover Evoque. Unveiled at the Guangzhou motor show, Landwind's most famous model now looks less like the Evoque on which its design was so clearly based. However, it is not known whether the brand has succumbed to global pressure about the design or if the refresh was already planned. On top of the new look, the X7 has a new 158bhp turbocharged petrol engine, according to CarNewsChina. It joins the 187bhp 2.0-litre unit, which is currently the only engine available. Elements of the Range Rover Evoque remain, but the lower front bumper and styling cues at the rear in the pre-facelift X7 have been tweaked. A chrome bar replaces the black plastic panel above the numberplate, for example. Despite those changes, the car’s overall shape remains unmistakably inspired by the Evoque, with the same sloping roofline, rising belt line, wheel arches and virtually all styling cues in the car’s profile. 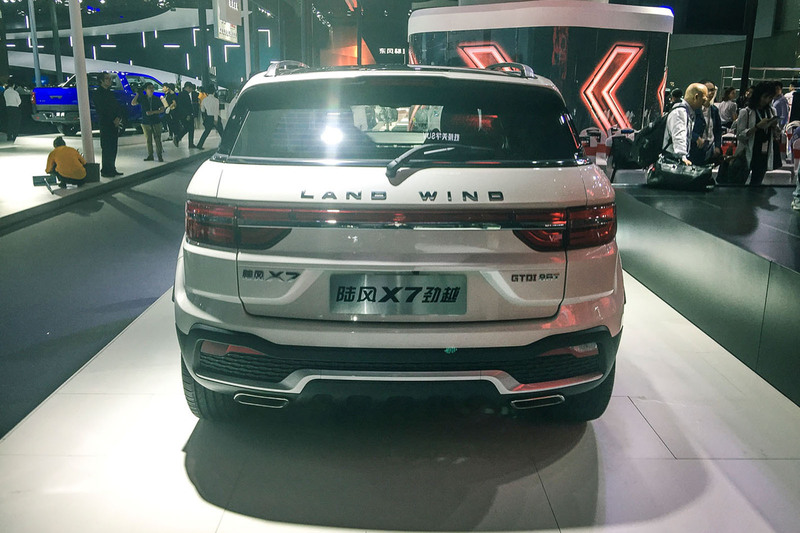 The X7 is at the centre of a legal battle between Jaguar Land Rover and Landwind; both brands had their patents cancelled in China. The two models were on display simultaneously at the 2015 Guangzhou motor show, with Jaguar Land Rover showcasing a locally made car as part of a local joint venture required to sell cars in China. Landwind’s X7 was launched in 2.0-litre petrol-engined guise at a cost of £14,000. This new 1.5-litre petrol model cuts the entry price to £11,432 – around a third of the Evoque's starting price. A race of people so historically clever, reduced to copying others' work, producing complete and utter crap, and a huge amount of pollution. U cant win this brazzer, plenty of chink trolls on Autocar of late! Plus their manufacturers will continue to do the same cause they are obviously an incompetent lot. I dont mind chinese cars especially if they are terrific value. But like the chinese MG branded products, they are neither good or priced competitively. People would prefer a Dacia over a chinese car anyday! The sad fact is the chinese started making cars in the 1940s! Thats a car indutry thats older than the Koreans and on par with the Japanese. But while the Japs and Koreans have made significant progress and have formed a part of the mainstream brigade, the chinese makers are still struggling with knock-offs or playing second fiddle partners to global majors and assembling their stuff. Even the chinese in china prefer International brands than their own! Sad! 'Chink' trolls? Really?! Forget about the Chinese car industry; I think it's your world view and language that are straight out of the 40s. The 1840s at that! Moderators - are you on a teabreak or something???!! Bazzer, I can only assume that you've never been to China and know very little of their history, or that of the motor industry. Yes the X7 is a poor copy of the Evoque but it's a warning sign. First the Japanese copied British designs then made more reliable versions. Then the Koreans copied European designs now they're a force to be reckoned with and are willing to offer warranties no western car brand would dream of. The Chinese are copying many designs but they have a lot to catch up on and they will. They have many many cars, many brands, and some copy blatantly, others are quite unique, others just plain terrible, but they have to catch up. When Chairman Mao took control and pursued and killed the intellects and drove out the democratic leaders, he effectively destroyed all that history of being smart, making solid and exquisite furniture and architecture, and reset the country. Do they pollute? Yes, their population is many times bigger than ours, and yet they create a higher percentage of their energy needs from renewable sources than the UK does. We polluted once too when we actually made stuff. Now nobody wants those jobs in the UK so who will? The Chinese will. They'll do it for less than you, and guess what, you'll buy it because it's cheaper than if it was made here. Whose fault is this? Producer or consumer? We'll it's a bit of both, but leave your misplaced ignorance somewhere else, or use those busy fingers of yours to do some real research and find some facts. I agree with all you say, zogle28, accept that the Landwind is NOT a copy - the Chinese have done exact copies before but the Landwind is not one, its just very similar. Thanks for your inane drivel. I'm hardly ignorant, I'm a physicist. And for reasons I'd rather not go into, I'm not at all ignorant of China and its history, though I admit I haven't been there. That doesn't negate my opinion, as I've never been to the Moon either, but I have scientific opinions on it. All that I originally stated is true, whether you like it or not. Zogle28, you truly are an obnoxious cnt. XXXXX, you're a Chinese fake too, only sadder!!! The original Landwing X7 was a clear copy. Decorating the exterior with more Chineseyness doesn't alter that fact.